The Architecture & Design club dates from 1999 when the University ran a series of seminars, during Glasgow’s year as City of Architecture and Design. Now in our eighteenth session, we are pleased to bring you a diverse and interesting programme of talks and visits for this coming year. The Club membership fee is £12 per annum, and everyone must also be a member of the 3Ls Students’ Association. The Club normally meets on the second Thursday of the month at 2.00pm in the Conference Room GH742 at 40 George Street, unless otherwise stated. At our March meeting we had an excellent talk from the double act of Graeme Baillie (Principal Architect) and Nick Cotton (Senior Masterplanner) with Glasgow City Council on the £250m regeneration of Sighthill (just north of the Townhead Interchange of the M8 motorway) which is the largest Transformational Regeneration Area outside London. When Glasgow City Council bid (unsuccessfully) for the 2018 Youth Olympics, to qualify it had to include plans for an Athletes’ Village. Sighthill was the chosen location and this was the spur for total regeneration of the area. The site was cleared of the last of the 10 multi-storey blocks and Glasgow Housing Association (GHA) progressed with what would have become the Athletes’ Village to the north of the site. Sighthill was originally the site of Charles Tennant’s St Rollox Chemical Works, at one time the largest chemical manufacturer in the world. As a consequence of its industrial past, the area was contaminated with immense quantities of “galligu”, a sulphurous waste resulting from soda production, which had to be totally encased and capped. This work is nearing completion. 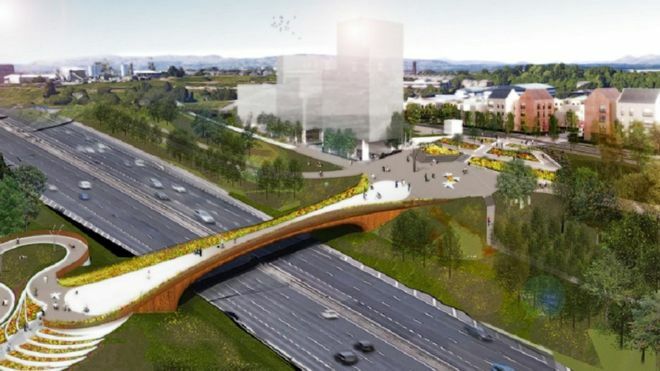 Image of proposed new bridge over M8. What Glaswegians will call it? Kevin Bridge(s)! a road-bridge over the Glasgow-Edinburgh railway line. The Regeneration Project is being funded by the Council, Glasgow Housing Association and Scottish Government. It is also one of the early action areas to benefit from the Glasgow City Region City Deal, jointly funded by the UK and Scottish Governments. At our February meeting we had an excellent talk from Paul East on the Burrell Renaissance Project. Paul, who has particular expertise in the heritage, cultural and museum sectors, heads up the Edinburgh office of John McAslan & Partners, the Project’s architects. A large part of the basement was not used and the auditorium underused. Financed through Heritage Lottery and capital funding, the Burrell Renaissance is to “breathe new life” into the building and address these issues. Access will be improved with additional entrances and more hard landscaping around the building. New areas will be opened up, which will greatly increase the display area and allow temporary/touring exhibitions. More controversial for some members is the removal of the Hutton Rooms, which had been a specification of the original design. Enhanced public transport is being considered and people will be encouraged to use the building and its facilities without necessarily visiting the museum. It is hoped that all of these measures will improve the visitor experience and increase visitor numbers, which had been in decline. 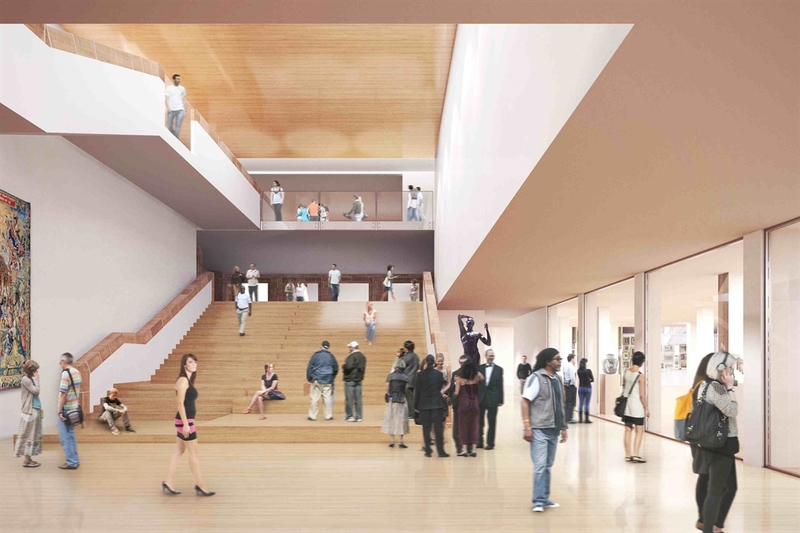 There is no specific date for the re-opening of the Burrell but it is likely to be in the second half of 2020. We look forward to its Renaissance and, hopefully, to a guided tour by Paul and his team! Dr Robert Rogerson is Academic Director of Strathclyde University’s Institute for Future Cities. 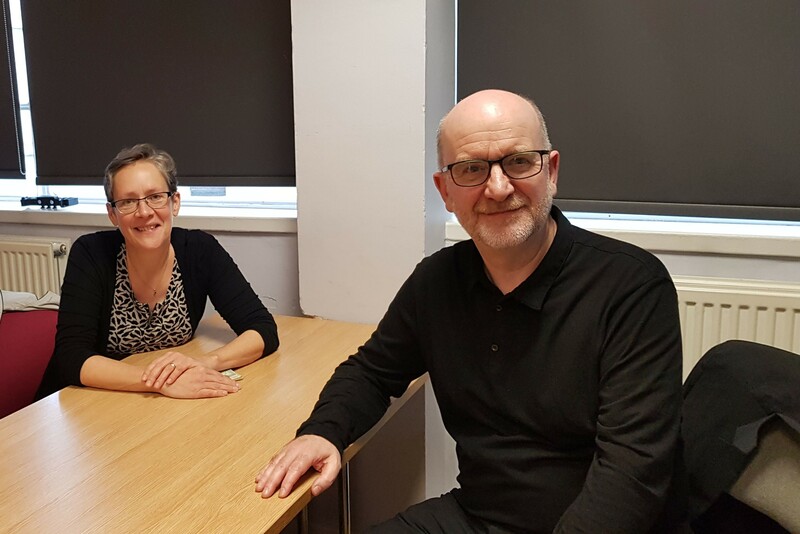 His involvement with research exploring the future of cities across four continents formed the backdrop to a discussion on the future of Glasgow, beyond retail. In his fascinating talk, Robert asked us to imagine the future of City Centres over the coming years, bearing in mind that cities have always undergone change and High Street shopping is under threat. Robert suggested that keys to the future are the purposes of cities and how those purposes are achieved. City planners should learn from the past, use good design and architecture, consider the use of the streets and employ vision when re-thinking the purposes of cities. Glasgow City Centre, for example, originally had a small central social and public area together with significant amounts of residential buildings. In the 1950’s there was retail led regeneration and movement of city residents to outlying spaces and the geographical area considered to be the City Centre expanded. Later large shopping centres in and close to the city developed. There was redevelopment of smaller sites in the the city centre, often using ex-transport sites and currently there is re-use of architecturally valuable assets, a mix of shopping and a certain amount of city centre re-population involving the “middle class”, students and visitors/tourists. Some small developments of affordable and rentable housing have also sprung up. The city of 2040 is likely to be one where there is less traffic, less pollution and more sharing of transport. Streets will be reclaimed for social and public activities and there will be more small shopping areas serving local residential neighbourhoods. City routes will be greener with an expansion of “cafe culture”. Retro-fitting old buildings will be preferred due to lower costs and lower environmental impact compared with new building works. Multi-utility systems will be more cost effective and more efficient. Technological developments could lead to central “offices” where shoppers decide on the design and delivery/installation of their desired purchases however, the products being sold are stored and/or custom made outwith the city centre and are issued to customers following an electronic order confirmation. Cities will become more responsive to needs. 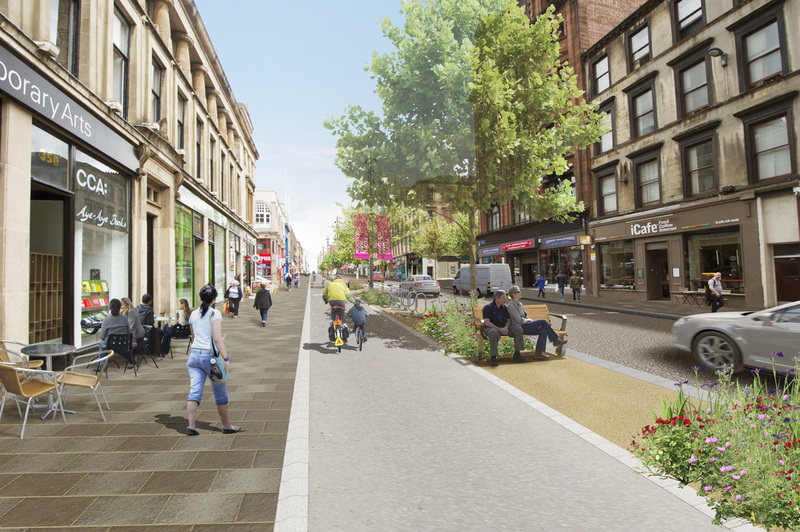 Glasgow is already undertaking a pilot “Avenues” project on Sauchiehall Street (see photo below – copyright Urban Movement). Improvements will include free Wi-Fi, intelligent street lighting, trees, cycle lanes, increased pedestrian/cycle space, continuous footways and reduction of street clutter. It seems that Glasgow is responding to current needs and working towards its future in 2040 and beyond. Our annual Christmas Get-together this year was held in the Billiard Room of the magnificently restored original Willow Tea Rooms in Sauchiehall Street. This was the only one of Miss Cranston’s many establishments that was solely designed by Charles Rennie Mackintosh (interior and exterior) and is of great significance for Scotland’s design heritage. Staff from Mackintosh at the Willow, together with volunteers from the Charles Rennie Mackintosh Society, provided a very informative tour of the Salon de Luxe, the Gallery (where we had a chance to look down into the Tea Saloon below) and then into the exhibition space. Here, some of our company enjoyed dressing up like Miss Cranston and others enjoyed the interactive exhibits covering both Miss Cranston’s Tea Rooms and also the architectural input of Mackintosh. After we were finished our tours, we returned to the Billiard Room where wine, mince pies and Diane Henderson’s marvellous (and sadly, final!) Christmas cake was waiting for us. Needless to say, this was all consumed with great enthusiasm. We were very fortunate to be joined by Celia Sinclair, who led the whole redevelopment and provided us with a most interesting insight into how the project came into being, including how she prevented the forced sale of the building that would have seen an end of the Tea Rooms and the loss of its contents. She also touched on just some of the many challenges faced, both in the financing of the project and subsequently ensuring the everything was done to the highest standards. We were also interested to learn that the Tea Room now operates as a social enterprise creating training, learning, employment and other opportunities and support for young people and communities. We truly wish it every success. The visit to the new V&A Museum proved extremely popular with over 50 members of the Club making the journey to Dundee. The building certainly lived up to the architect, Kengo Kumo’s vision as a welcoming space for everyone to visit, enjoy and socialise. The facilities, including the catering area, were first class and coped well with the number of visitors. Much time was also spent in the Scottish Design Gallery, illustrating the ingenuity and originality of the Scottish designers. Unfortunately the inclement weather, which coincided with our arrival in Dundee, prevented a proper opportunity to explore the external aspects of the building, the vistas of the River Tay and the backdrop of the surrounding landscape. However, that, and the museum itself with the prospect of further exhibitions, created a desire in some members to make a return visit to Dundee. Heather Jack, ceramics historian and President of the Scottish Pottery Society, gave a most interesting talk on H.T.Wyse who, although not widely known today, was a leading member of the Arts and Crafts movement in Scotland. Born in Glasgow, he moved to Dundee where he completed his secondary education. He was first apprenticed as a clerk in a whaling company in Dundee and then changed direction to study Art which was his main interest. He taught Art in Coatbridge, Arbroath, Edinburgh and finished his career as Principal Lecturer in Art at Moray House College of Education, Edinburgh. As an artist Wyse undertook many painting trips to the Low Countries and France. He had a particular interest in pastel and watercolour. He also produced lithographs and prints. Trees featured in many of his works. As well as fine art, he had an interest in printing, furniture and interior design, jewellery, metalwork, gesso and textiles. One of his cabinets with gesso panels featured in the Mackintosh exhibition in Kelvingrove Museum and Art Galleries in 2018. Today, H.T.Wyse is possibly best known for his Holyrood Pottery which he established in Edinburgh, operating from 1917 to 1927. He designed the pots and glazes, the pots being thrown by George Griffiths, an experienced potter. Examples of the pots can be seen today in the Museum of Edinburgh, Canongate. The Architecture & Design Club was privileged to hear an inspiring talk by Neil Gillespie OBE, one of the foremost architects working today in the UK, about his design philosophy. Neil, a director of Reiach and Hall Architects in Edinburgh, has been involved in a large number of high-profile award-winning projects throughout Scotland, including twice for the best ‘Scottish Building of the Year’ Doolan Award. He entitled his talk ‘Making a Mark’ and indeed this was the real subject of our afternoon – his passionate belief in a high level of Design Quality and a commitment to communicating that through dialogue, modelling and drawing to clients and others alike. He was responsible in 2013 for the winning of the Kilmartin Museum Redevelopment (seen in photo with Rachel Hunter, heritage consultant who joined Reiach & Hall’s team for the Kilmartin Museum Redevelopment’)., and has been involved since then in the project’s development and support by the Heritage Lottery Fund. He was able to give us an insight into the original design ideas for the museum, which is to house internationally important artefacts from the Neolithic and Bronze Age Kingdom of Mid-Argyll. As part of the architect’s remit, these exciting proposals have more recently been subjected to an affordability exercise with the final design awaiting funding agreement. His audience were left somewhat disappointed that he could not, therefore, share final design proposals with us. However, instead we were treated to a talk which had passion, commitment and much poetry in it on how to design an excellent building – by someone who has. Neil Gillespie, a director of Reiach and Hall Architects, talks about the design proposals for an exciting new museum telling Scotland’s ancient story of Mid-Argyll’s Neolithic and Bronze Age Kingdom. Ceramics historian and recent President of the Scottish Pottery Society, Heather Jack, will give a talk on the design work (in pottery, furniture and interiors) of Henry Wyse, a leading member of the Arts and Crafts movement in Scotland. Visit to the new V&A Museum in Dundee including the opening exhibition ‘Ocean Liners: Speed and Style’ Cost £18. Booking required. Dr Robert Rogerson is the Assistant Director at the Institute for Future Cities, University of Strathclyde. Although his talk will focus on Glasgow, he is involved in setting up an international network exploring the future of city centres across all continents, and has led research programmes on sustainable communities and the quality of urban life. 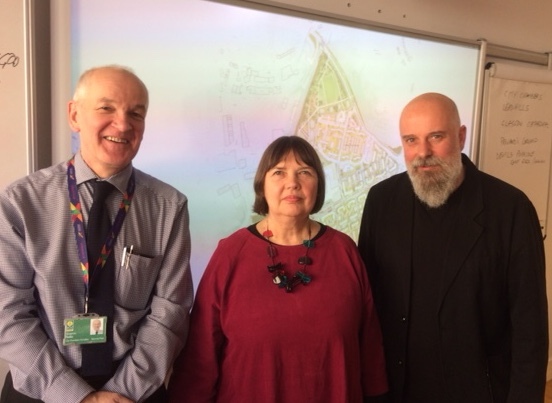 Graeme Baillie (Principal Architect) and Nick Cotton (Senior Masterplanner) with Glasgow City Council will talk on the £250m regeneration of Sighthill, Glasgow, the largest such project outside London, where the community will be revived with 1000 homes, a new schoool, shops and public realm works. A visit to the award winning development of Carnegie Library and Galleries in Dunfermline by Richard Murphy Architects PLUS a visit to Mansfield Traquair Centre, Edinburgh. Full details to follow.